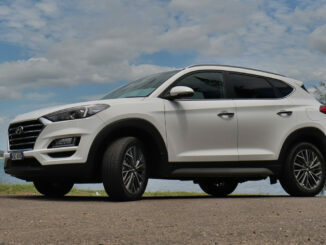 A great big family off-road SUV that's still quite basic at heart! 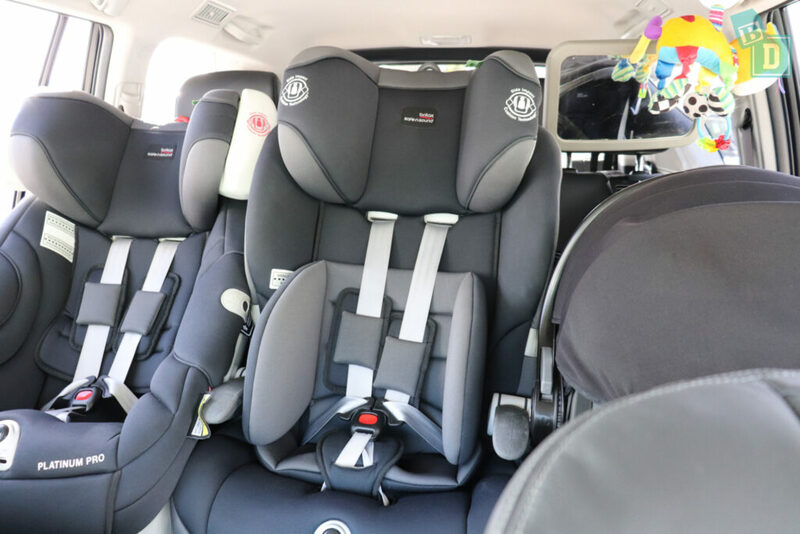 The Toyota Prado is a big seven-seater that I haven’t driven since late 2017 when we used it to make our first BabyDrive video, which was a disaster and never made it to the website!! So I was keen to get in one again and this time make a video review for BabyDrive that does make it to the site!! 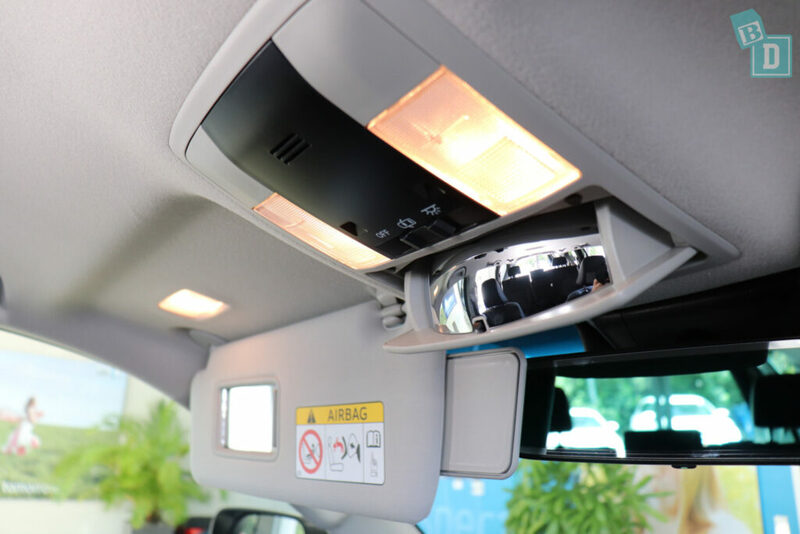 The LandCruiser Prado was exactly as I remembered, really large and with some fantastic BabyDrive features like the conversation mirror so you can keep an eye on the rear passengers without having to turn your head away from the road. And the central console box is a huge Esky! Which I found this fantastic feature for keeping snacks and drinks cold on hot days when you’re out and about. Overall I found the Prado quite impractical in many ways too, the third-row seats are quite difficult to put up and down, they are very heavy and the mechanism very stiff especially at 162cm I actually found them hard to reach. I was disappointed for such a large car that there were only three top tethers and two ISOFix points, all in the second row, so I couldn’t install child seats in the third row! 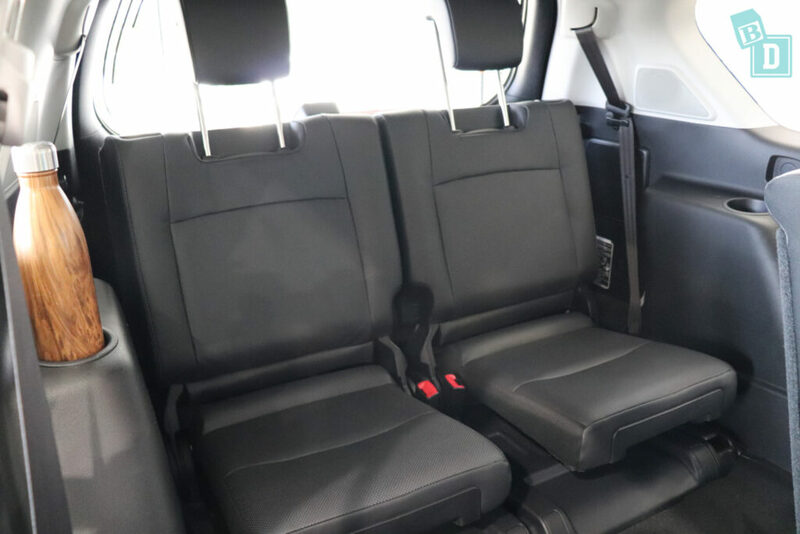 It always such a shame for large families needing to fit four or five child seats and that so many of these enormous seven-seaters don’t accommodate. Fitting three child seats in the second-row was a bit of a squeeze too! I was surprised again for such a big car I expected three seats to fit easily but I couldn’t fit three big forward-facing child-seats in. Only two forward facing and a rear facing capsule. It was a much easier fit with just two child seats. 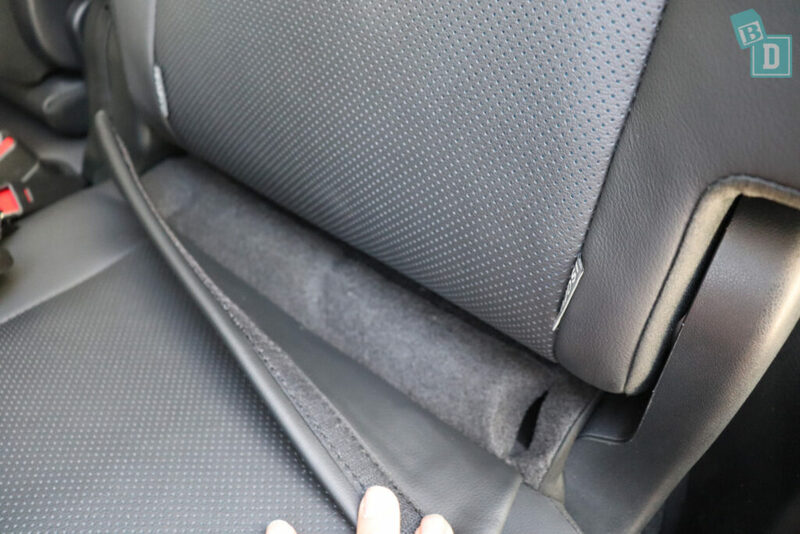 The ISOFix points are quite hidden under a large velcro flap that goes across the width of each seat base and I always worry that velcro will collect child crumbs and detritus and over time will look really scruffy. The ISOFix points are concealed behind flaps of seat fabric, stuck down with velcro which for me is the weakest link in the whole car! I think over time the velcro will collect dust, fluff and food and will also easily get caught on clothes and ruin them. Storage in the back of the Prado was good when only using five seats. 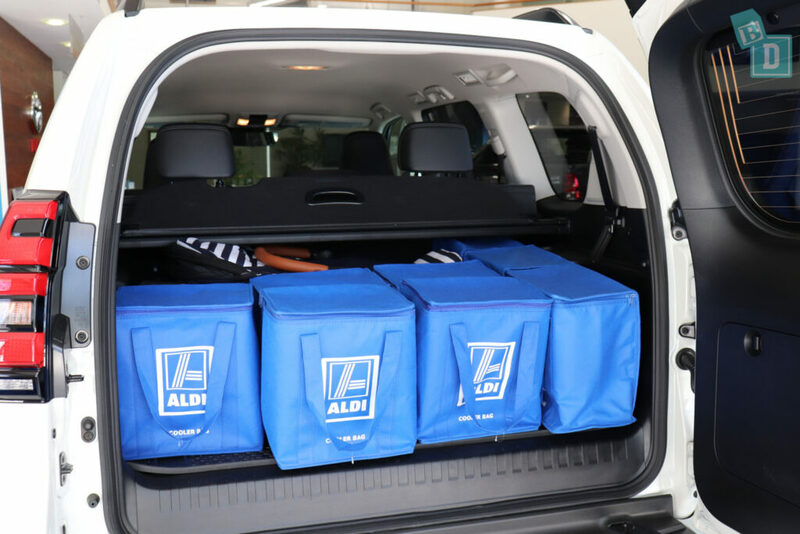 It would hold 17 shopping bags or any type of stroller fitted with a good amount of shopping around it. 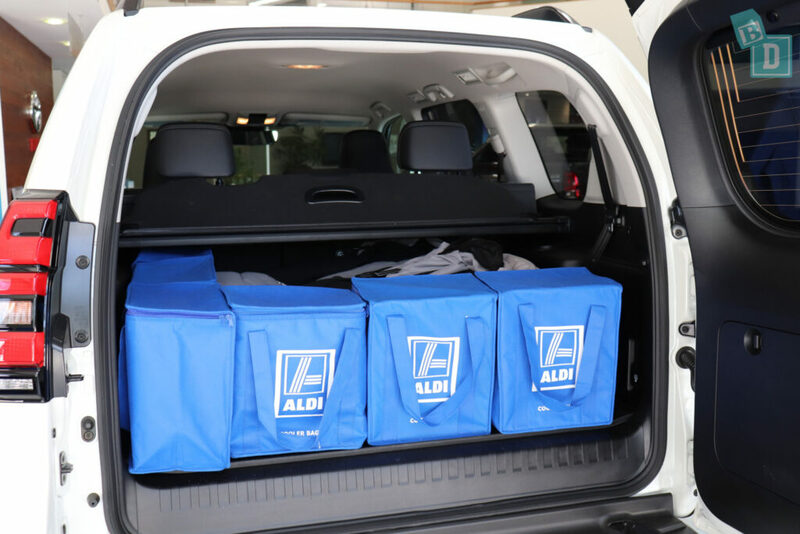 When using all seven seats the boot space was pretty impractical and there was only space for three shopping bags. No strollers fitted, not even the compact ones! The boot floor was nice and flat, with a rubber mat, which would be easy for hosing clean and when only using five seats it is suitable for an emergency nappy change. The boot of the Prado hinged/opened outward from one side like a barn door. 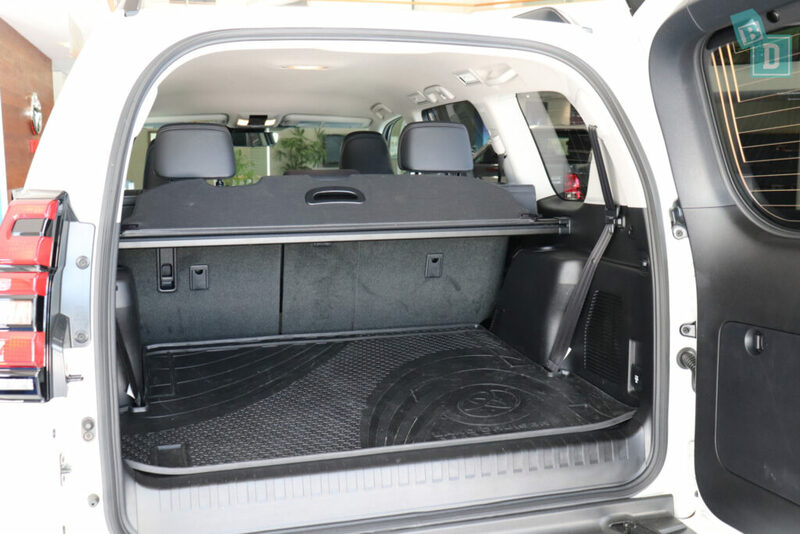 On the VX model I reviewed, the top glass panel could be opened on its own as the spare wheel is stored under the vehicle, whereas on the other models the spare wheel is mounted on the boot door and the glass panel doesn't open. Models with the spare wheel on the back have a larger fuel tank. I found that not having the wheel there on the VX made the door much lighter and easier to open and I liked the opening glass panel because if you reverse park into tight space you can still access the boot. I have concerns over the large side-opening hinged door because it is held in place by an arm that is at toddler height and has the strut that locks it in place has a really simple twist operation, so on any kind of incline that heavy door could cause a bit of damage to an inquisitive child! 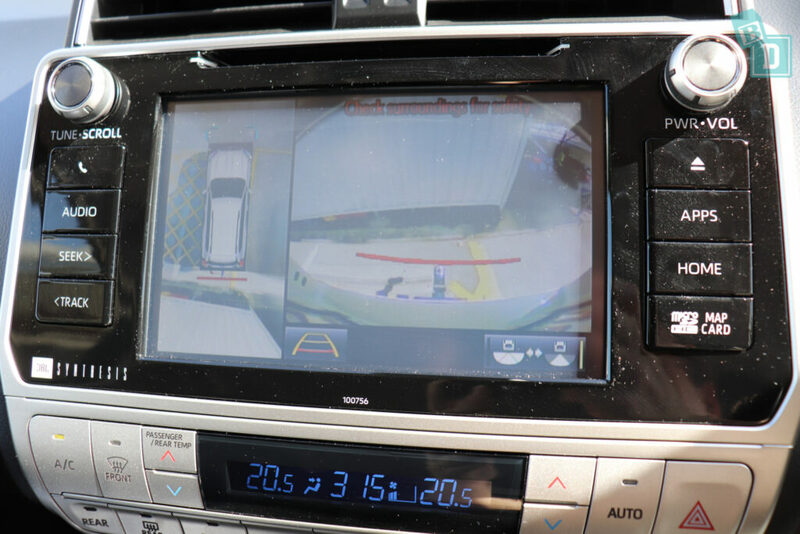 The media screen is very milky so when you are using the reversing camera it’s actually quite hard to see properly. 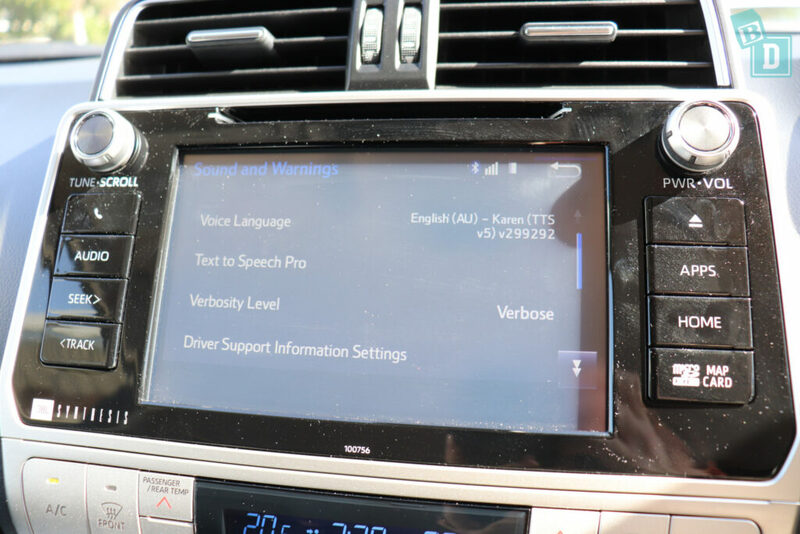 The media system does not have Apple CarPlay or Android Auto and feels outdated to use. The dash and central console is a spattering of buttons which I actually found quite confusing, it feels as if a new button has just been added each time a new technology is installed rather than being designed to be there from the beginning. The Prado does seem to pitch and roll a bit when driving around suburban and town roads and feels like it would be more at home on corrugated outback tracks than suburban streets. 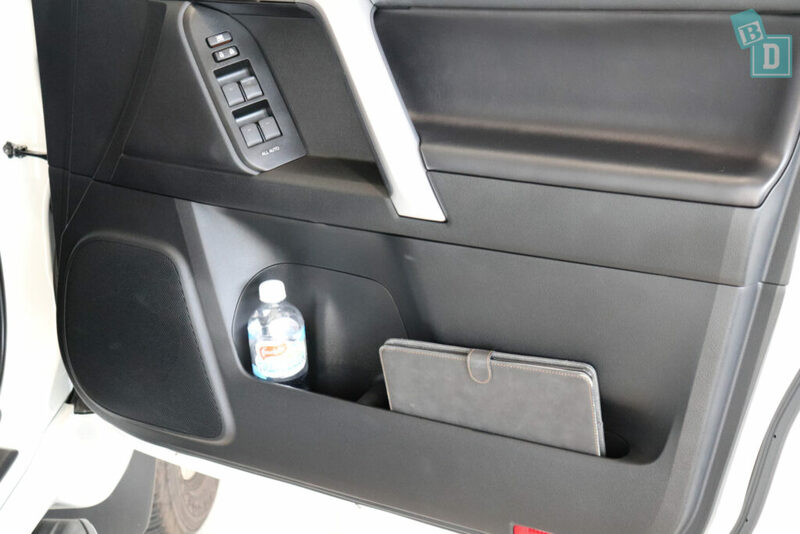 The central console Esky is a fantastic storage feature, however storage in the rest of the Prado is not as well thought out, the covered hole below the media screen would be good for storing your phone but it has a slippery surface and my phone just slid around in there making a scraping noise, all the time. 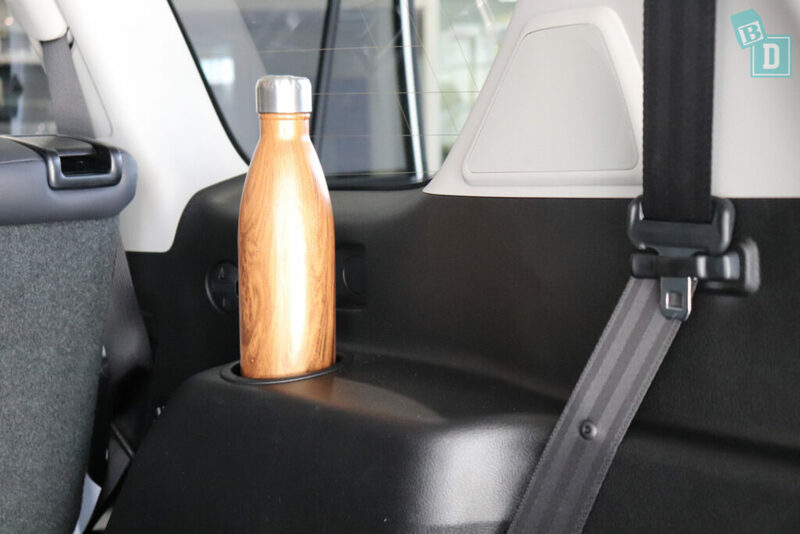 In the third row, there is a cup holder big enough to hold my large refillable water bottle, it feels crazy in a car of this size that none of the door pockets in the front are big enough. 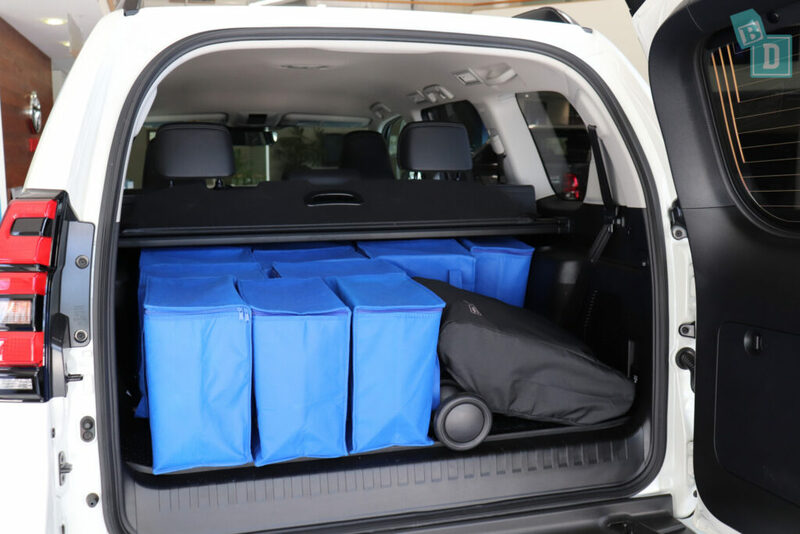 So… How big is the boot of the Toyota Prado? 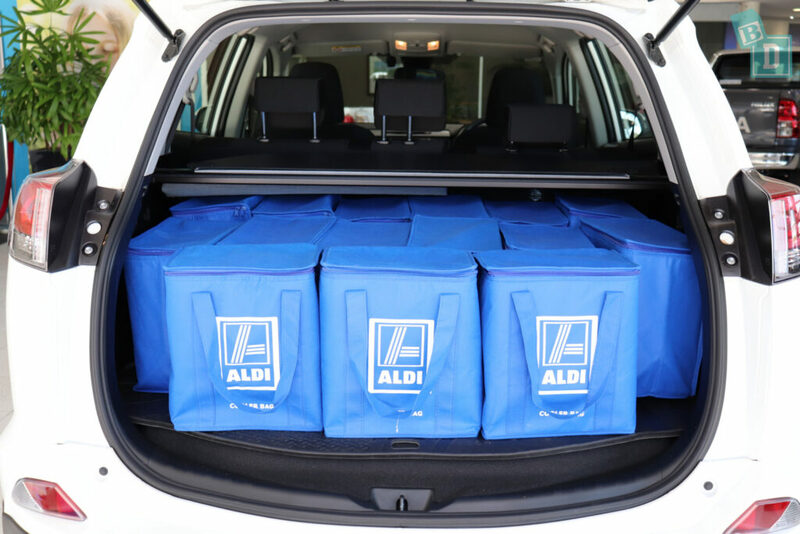 When only using five seats I could fit 17 shopping bags in the boot. I measure the boot space in freezer shopping bags, prams and dogs. Not because I think all there is to a mum’s life is food shopping, prams and dogs. (Although it can feel like it sometimes!!) But because these are visually measurable items we can all associate with. For me, the car company boot measurement of litres is not an amount I can easily visualise and 400L in one car may differ in usability to that in another due to the configuration or shape of the space. The Mountain Buggy Duet twin stroller fitted with six shopping bags beside it. The Britax Flexx tandem stroller fitted with five shopping bags beside it. The Mountain Buggy Urban Jungle single stroller fitted with 8 shopping bags beside it. The Mountain Buggy Nano compact stroller fitted with 12 shopping bags beside it. Or you could fit a large dog in there! The boot floor is nice and flat with a big rubber mat that would be easy to take out and hose down. It’s also a good space for emergency nappy changes. 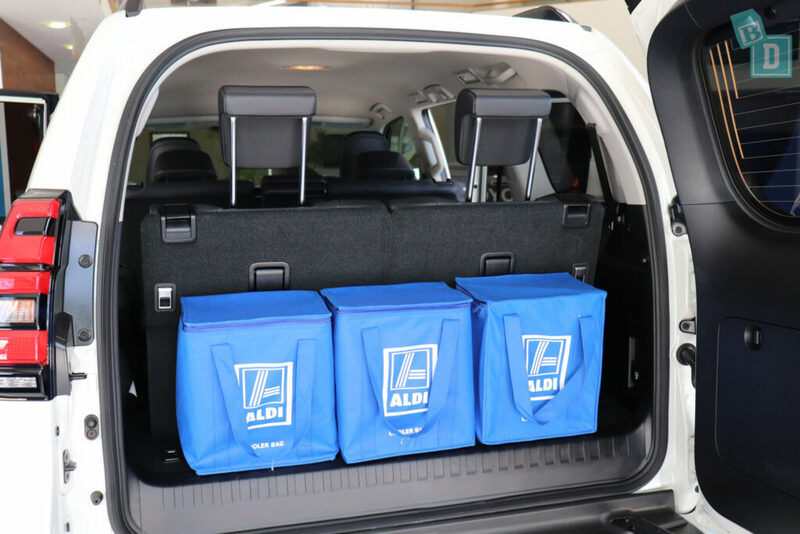 When using all seven seats the boot space is really tiny and will only hold three shopping bags. I couldn’t get any strollers to fit, not even the compact ones. Storage in the cabin was okay. 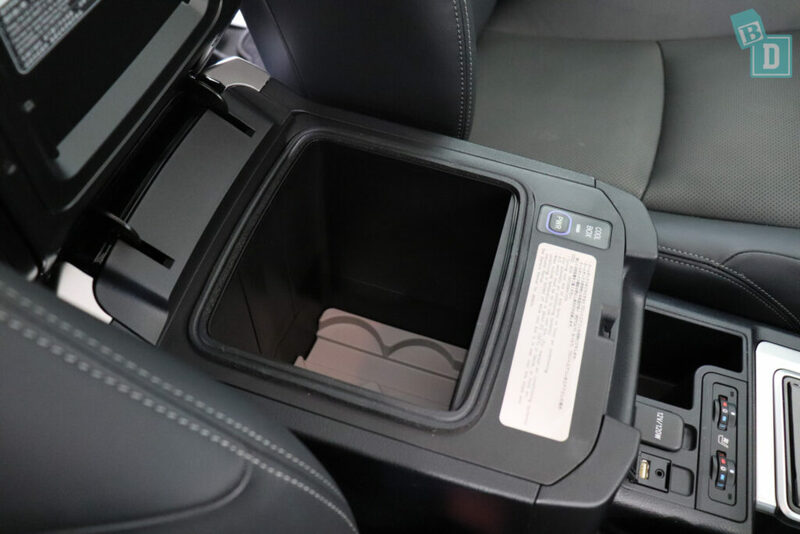 In the central console, there are two cup holders which would fit disposable coffee cups. Just above them is a covered recess, which I found to be the only sensible place to put my phone, but the USB to plug my phone into is back behind the gear lever so you do have the wire dangling around. Also, the surface is slippery in the recess so my phone slid around when driving and makes a baby-disturbing noise! There is a small storage well next to the USB and 12V sockets but again my phone rattled around in there while driving and made baby waking noise! There is a glasses holder in the ceiling that is also a conversation mirror and both front visors are extendable and have lit vanity mirrors in them. 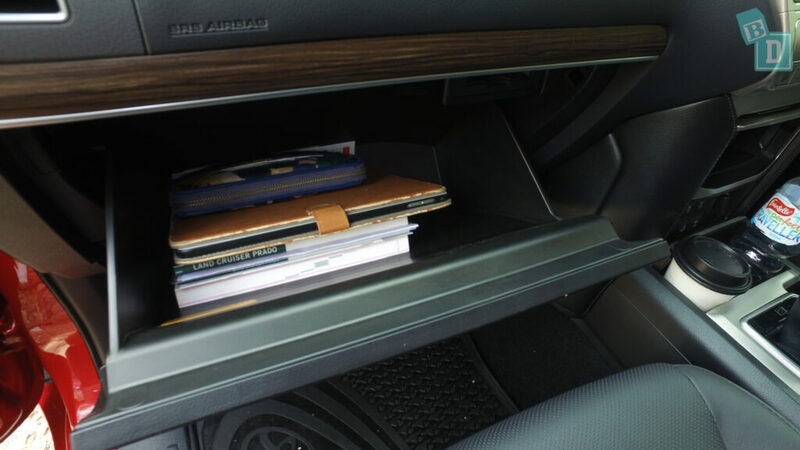 The glove box was a good size and would hold my iPad and wallet as well as the manual. The door bins in the front were long enough to hold my iPad but the bottle holder area was disappointingly too small to hold my large refillable waterbottle. It was the same in the second-row door bins, they were even smaller and were only big enough for a 600ml water bottle. In a fold-down armrest in the second-rows central seat are two cup holders, I found these would fit a re-usable or disposable coffee cup and a large refillable water bottle fitted in there too. 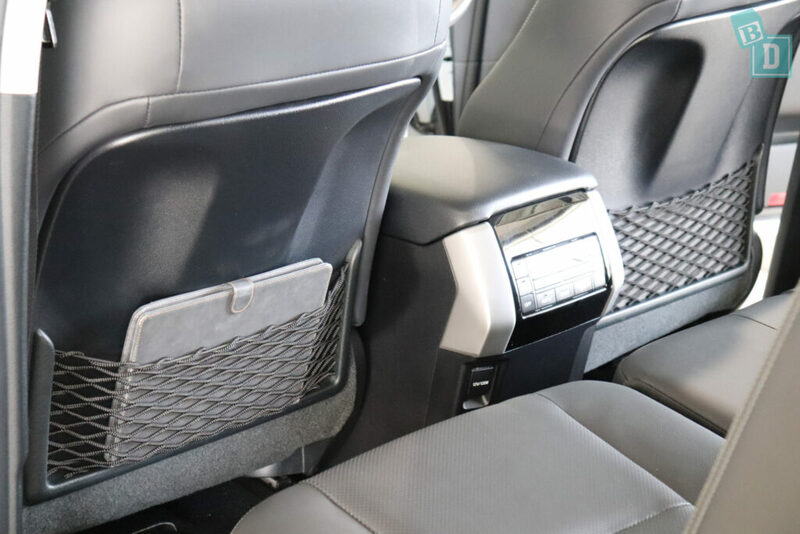 There are net map pockets in the back of both front seats, they will hold an iPad but not conceal it. 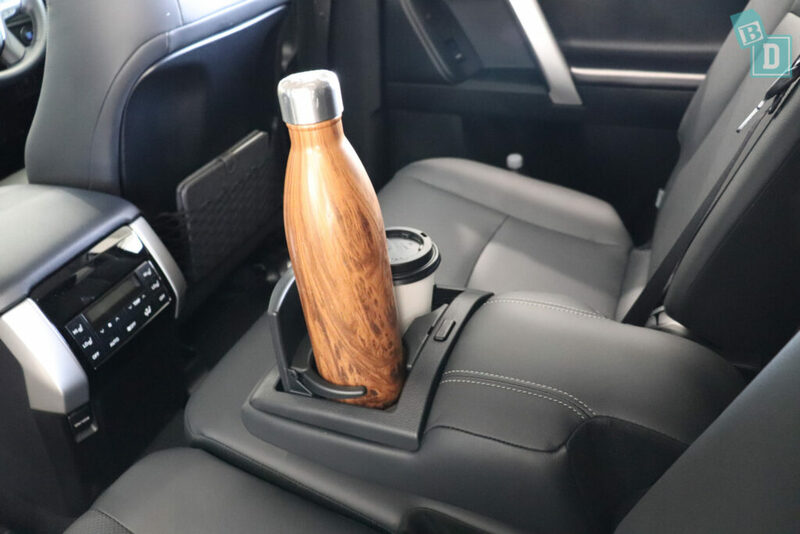 For the third row seats in the Toyota Prado, there is just a cup holder but this is large enough for a large refillable water bottle. 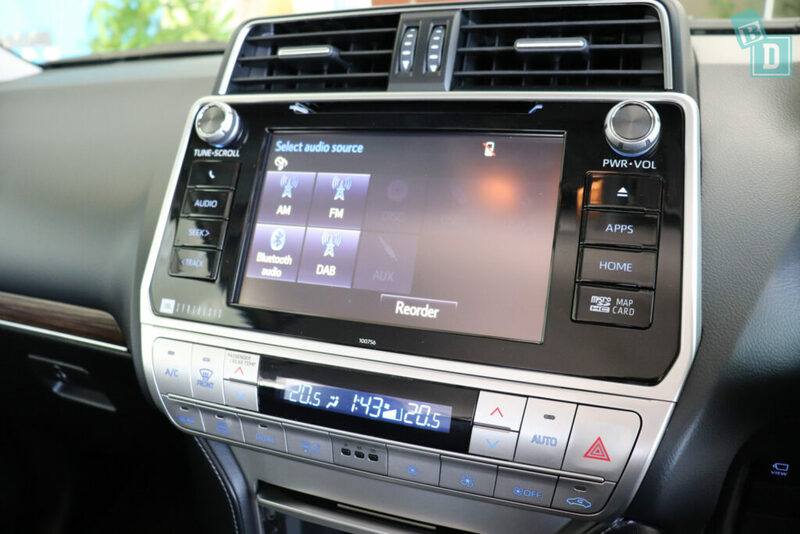 So… How noisy is the Toyota Prado? The reversing camera image in the Prado appears quite milky in the sunlight which makes visibility quite difficult, it did improve greatly when parking in the shade but of course that'snot always guaranteed! I found I could turn the parking sensors on and off with a button by my left knee but not just mute them. There is also a button there to change the camera view too, which I found useful for parking such a large vehicle especially the side kerb views. There is lane departure warning in the Prado, which you can turn on and off with a button on the right side of the steering wheel. The indicators are nice and quiet in the Toyota Prado and I didn't find they would disturb a sleeping baby. I found I could not easily mute the Sat-Nav voice on the map screen but I could go into a sound settings screen and change the Verbosity levels of the map guidance. 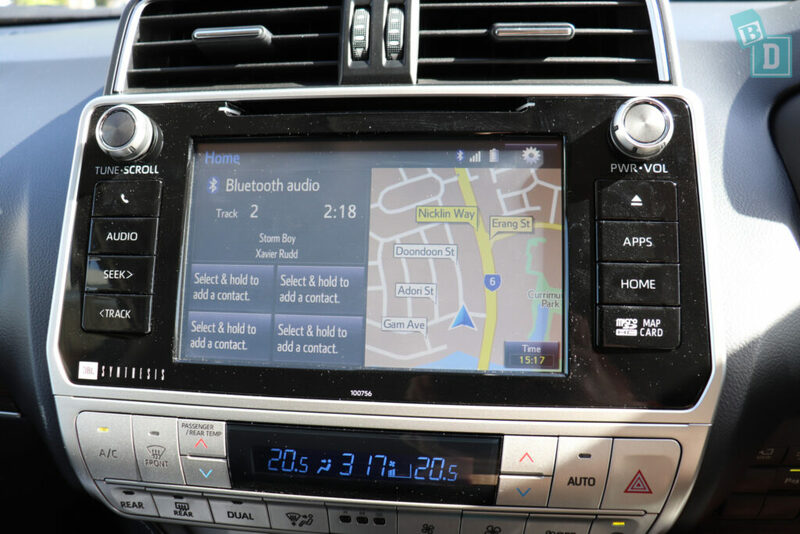 The Prado media system doesn't feel very up to date, it is easy to navigate, but does not have Apple CarPlay or Android Auto either, although I did find it quite simple to connect my phone via Bluetooth. The doors and windows of the Prado have a really nice, quite mechanism to both open and close which is a surprise for a vehicle this size. 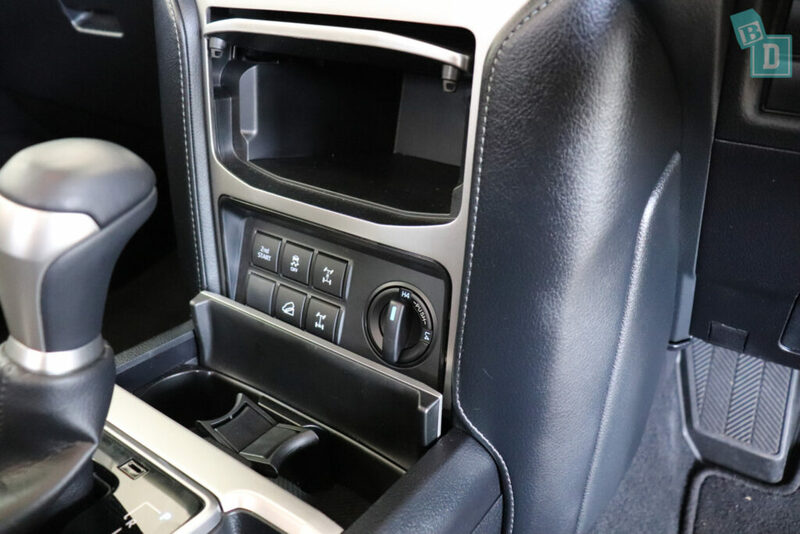 The doors and windows can both be locked from the driver's door control panel and I found you can come to a stop with the engine still running and get out of the car without sounding any alarms. There are seatbelt removal alarms but only for the front row seats, not the second or third row, the alarm sounds and a warning light alerts you on the screen in front of the steering wheel too. This seems crazy that the two seats you can see have an alarm and no the second and third-row seats where you can't see if your little ones have undone their seatbelts! 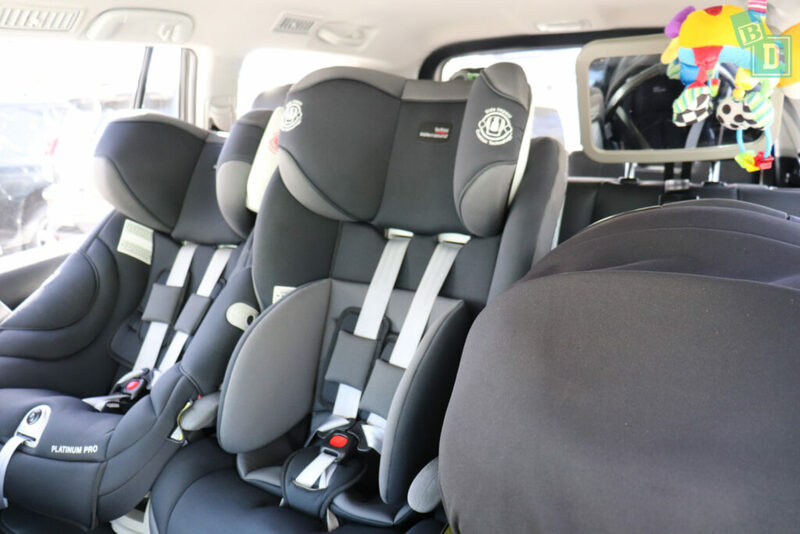 So… How many child seats fit in the Toyota Prado? 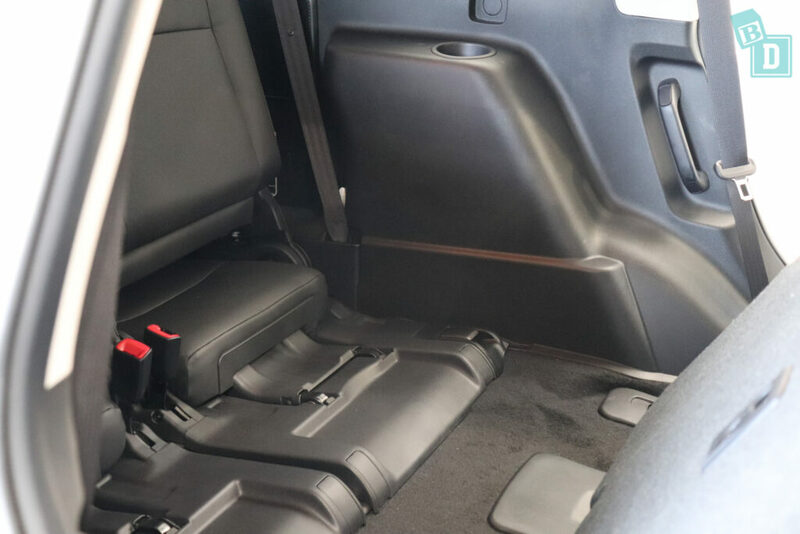 There are three top tether points across the second-row seatbacks; I found they are not easily accessible through the boot at my height (162cm) unless you climb up into the boot and, I found they were best reached over the seat backs. They are within plastic guides that are clearly marked and I found them easy to connect to. 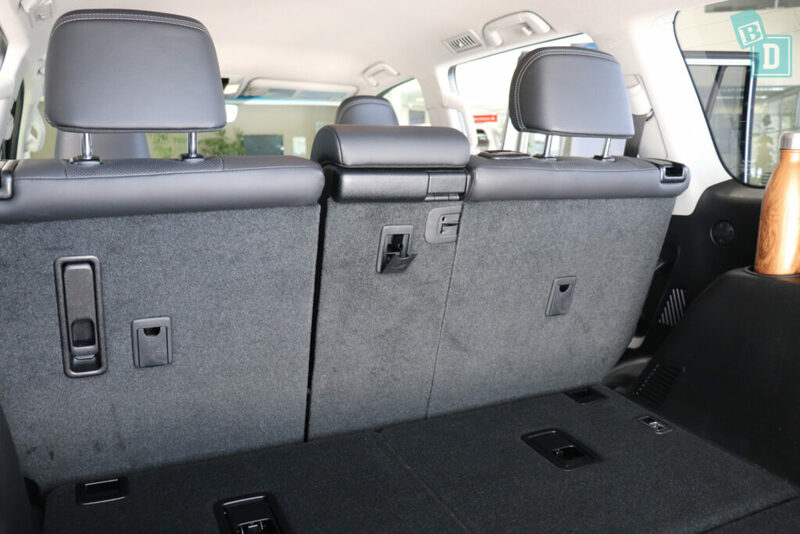 The two outer second-row seats have ISOFix points hidden behind a large seat fabric flap between the base and seat backs. 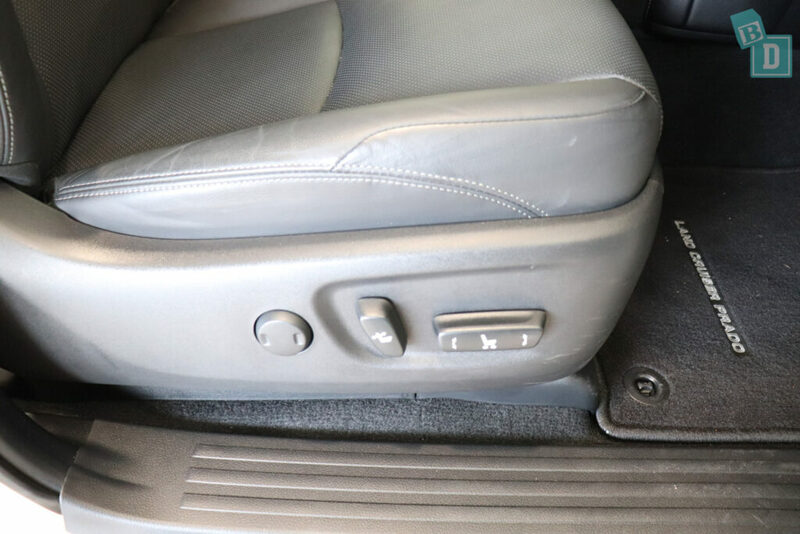 The ISOFix points are not within plastic guides and are quite hidden in the upholstery. The fabric flap is held down with velcro, which I am sure will catch on clothes and fill with child crumbs, fluff and spills and not age well over time. I managed to fit three child seats into the second row of the Prado. 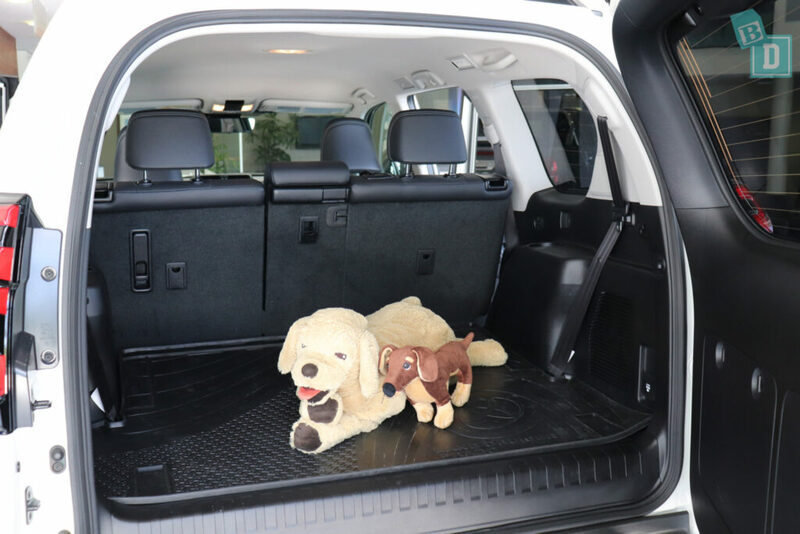 It wasn't the easiest fit, and for such a large car the child seats were very snug. 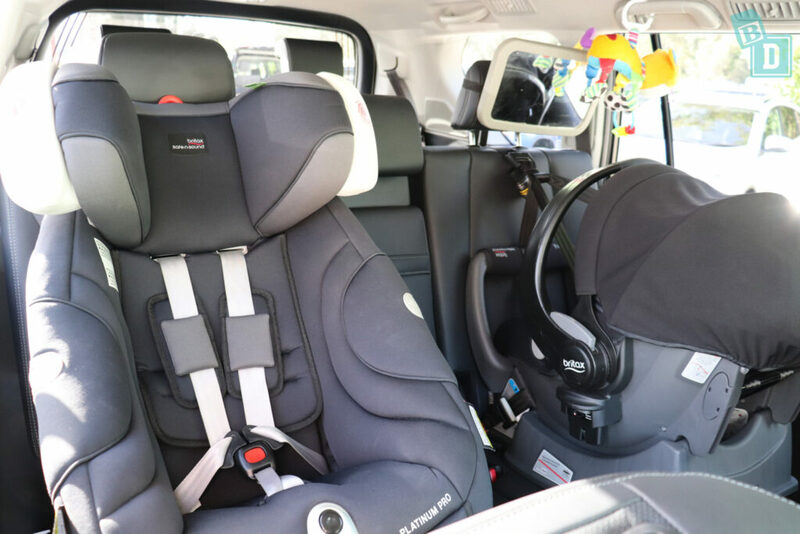 I installed the forward-facing Britax Maxi-Guard Pro and Platinum Pro and the rear-facing infant capsule. I found I couldn't fit three forward facing child seats across the second-row seats there wasn't enough room. It was a much more spacious two child seat fit. There are no top tether or ISOFix in the third-row seats so I could not install any child seats back there. I found pulling up and collapsing down the third-row seats quite tricky, they are incredibly heavy and the mechanism really stiff to use and I could only just reach to do it from standing outside the car and I'm 162cm. Posting bub into their child seat is easy from inside the Prado as you have a great amount of headroom. Equally, from outside the car, the doorways are nice and large and open with plenty of space to post bub in. 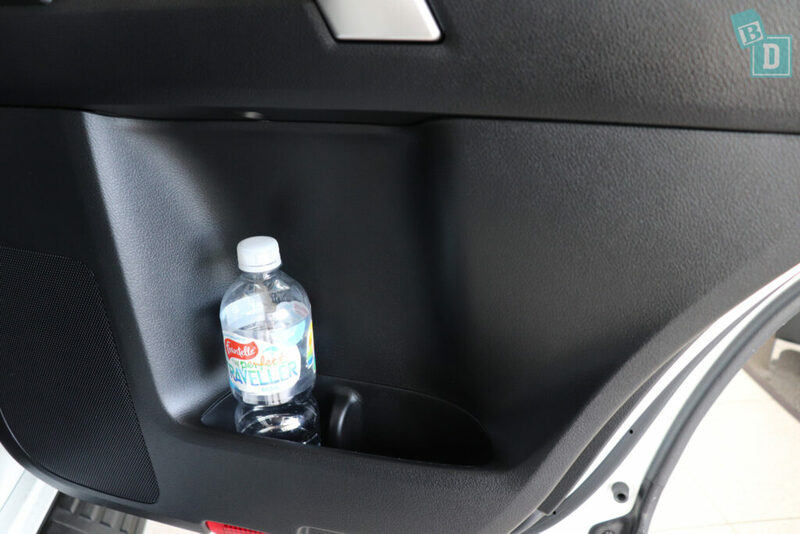 There is room to feed bub in the back if you only have one child seat installed. 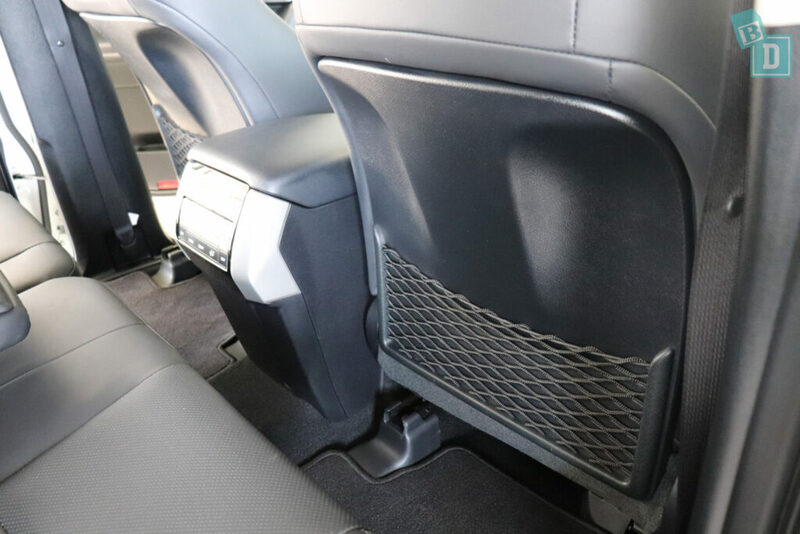 The seats are upholstered with ‘vegan leather' which is perforated in the central panels in all seats which would be hard to keep clean of child spills and crumbs. 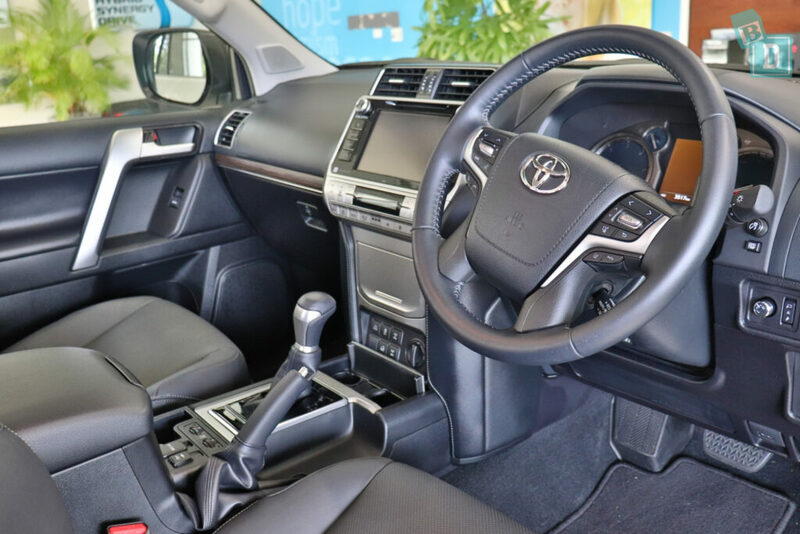 So… How comfortable is the new Toyota Prado? And How good is the Toyota Prado to drive? In the front of the Prado I tested, the seats are nice and comfortable and had electronic adjustment and although the headrests are not adjustable I could wear a ponytail! For a mum travelling in the second-row with bub, the seats are comfortable too and there is great headroom. The central backrest is a little harder than the others because of the fold-down armrest and cup holders. There is also a slight hump in the floor you need to straddle in the central seat too. 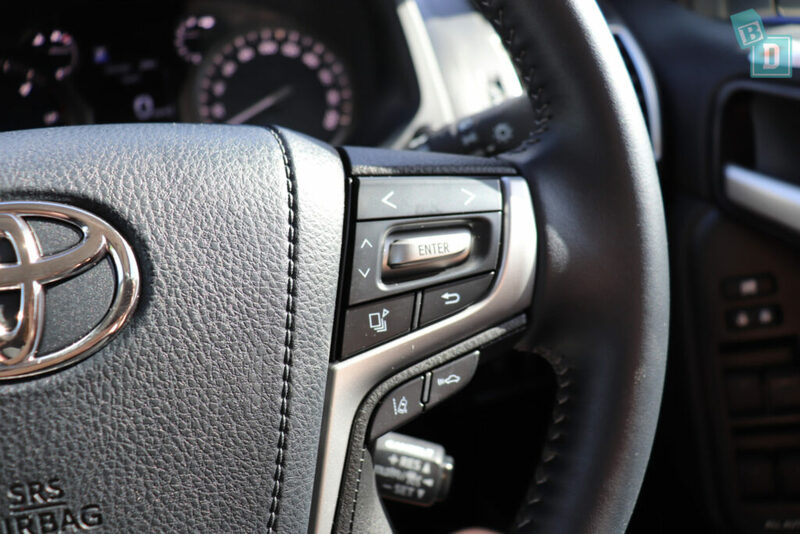 The Prado's steering wheel is fully adjustable in/out and up/down. 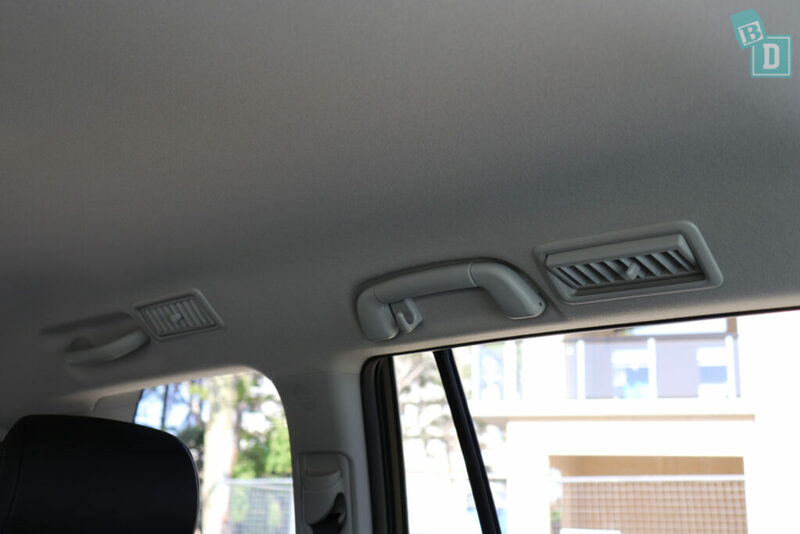 Across the front dashboard, there are four air-conditioning vents; two central ones and one at either end. There are rear air vents in the ceiling above the doors, alongside the handles, in both the second and third-row seats, I have found with our daughter that the ceiling vents are more disturbing as they'd blow directly down on her, especially when she was a baby in a rear-facing capsule. 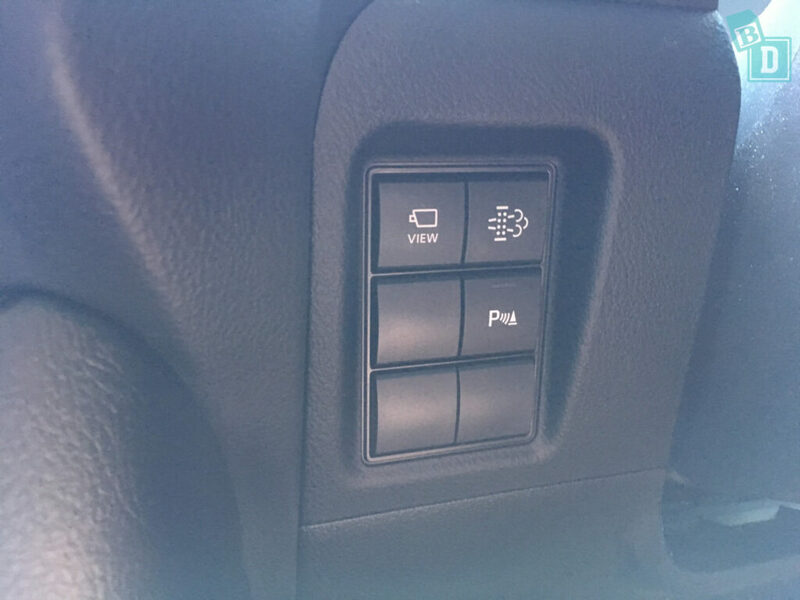 The button controls for the aircon are on the central dashboard, which I found nice and easy to locate and use whilst driving. You can control the rear air-con using these too, which is a great BabyDrive feature. 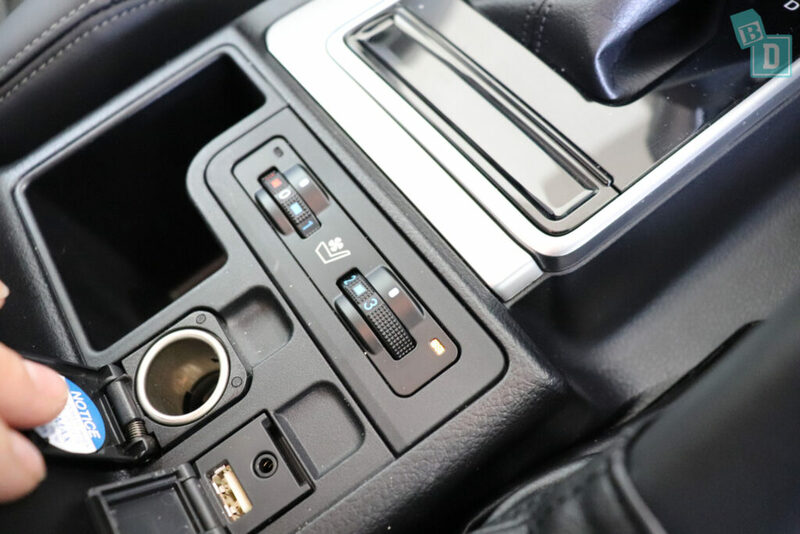 There are more controls for the air-con in the back of the central console box, but you can override this from the front if you are travelling with kids that squabble over or fiddle with the fan and temperature buttons!! 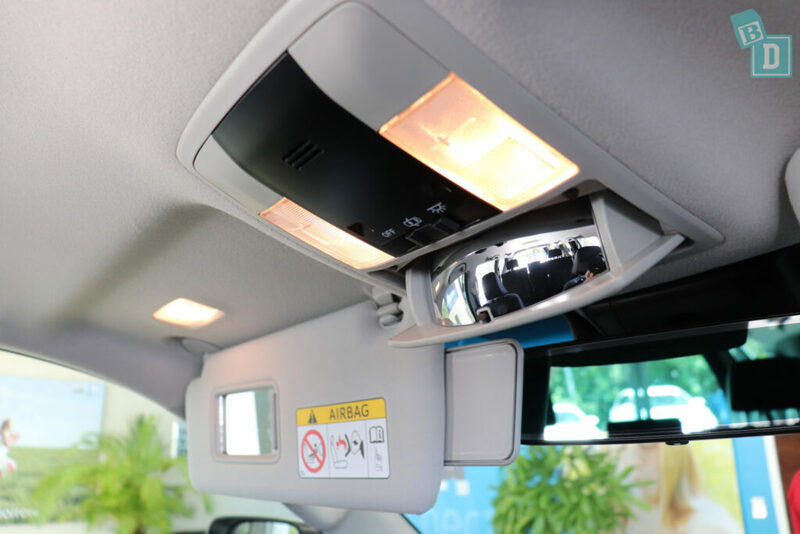 There are lit vanity mirrors in both visors in the front and the visors are extendable too. There is also a glasses case in the ceiling which doubles as a conversation mirror, I LOVE these as I can see what's going on in the back at a glance without having to turn my head away from the road. The interior lights in the back are in the ceiling centrally above the second and third-row seats but they can not be reached from the front seats. Once you have three child seats installed in the second row of the Prado, visibility out of the window is a bit limited for the driver. 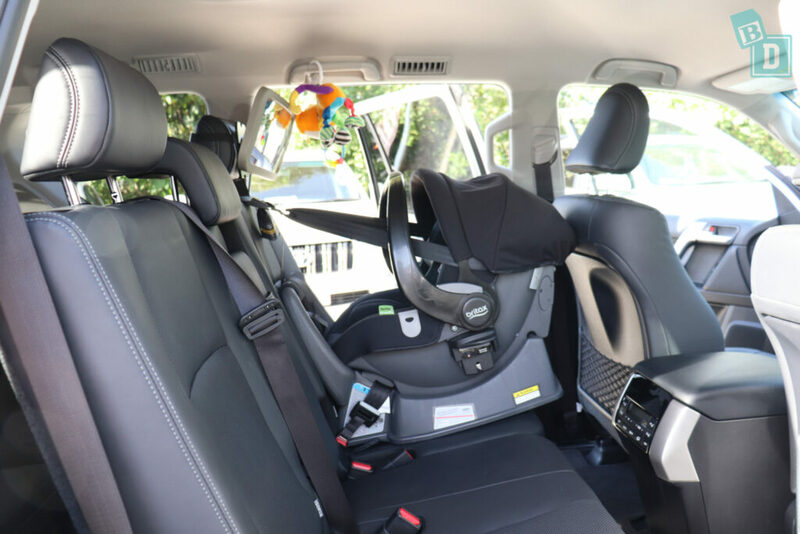 For little passengers, the windows are deep so they get a good view out and the higher riding position means visibility high and far is good but around the ground level of the car where little kids could be is not as easy to see. 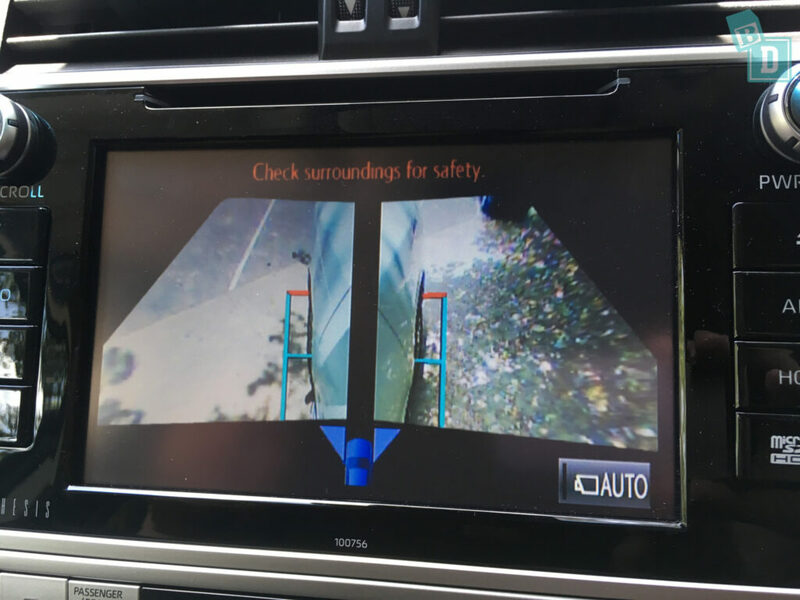 The reversing camera does have many views to allow for this which is great, however, the view is not very deep and the image could be a little clearer. One thing I have noticed since being a mum is I hate it when I reach a destination or get home from being out and Tulsi has either done really well in the car or she is screaming her head off and I have done really well to keep it together for the entire journey (usually the latter!!) and it takes 10 minutes to park the car! It can be really stressful. 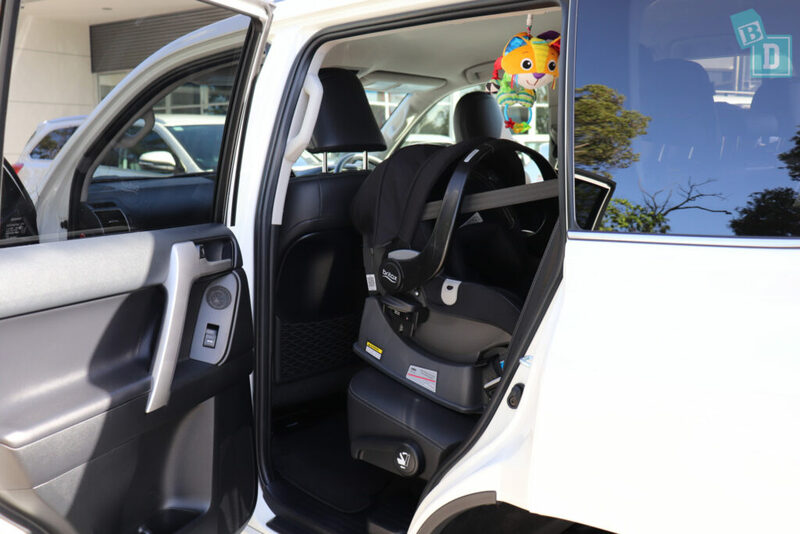 Since having our daughter I usually dread parking big, new cars as they take longer in our tight apartment block carpark, the Prado wasn't simple to park with the visibility effected by the three child seats and the cameras image wasn't so good! There are handles in all three rows of seats and in the second-row they are well positioned to hold a baby toy for rear-facing passengers. There are ‘vegan leather' panels in the doors of the model Prado I tested, so they would be easily wiped clean. 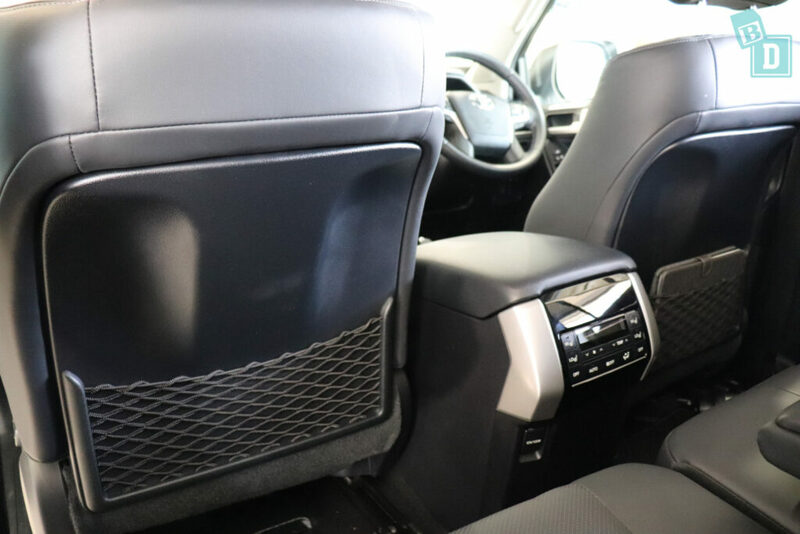 Lower spec models may have woven upholstery panels which would be harder to keep clean. There were carpet floor mats in the cab of the model I tested. And there was a big rubber mat in the boot of the model I tested, which is great for taking out and hosing down when it gets dirty. However, it only fits when using five seats, not seven. Aesthetically the Prado dash does have a bit of a feel of buttons being added higgledy piggledy rether than designed to be in their position and being the higher spec model I tested it does have a more luxury feel interior. The seats in the front are heated and cooled which was fantastic for a hot Queensland day! 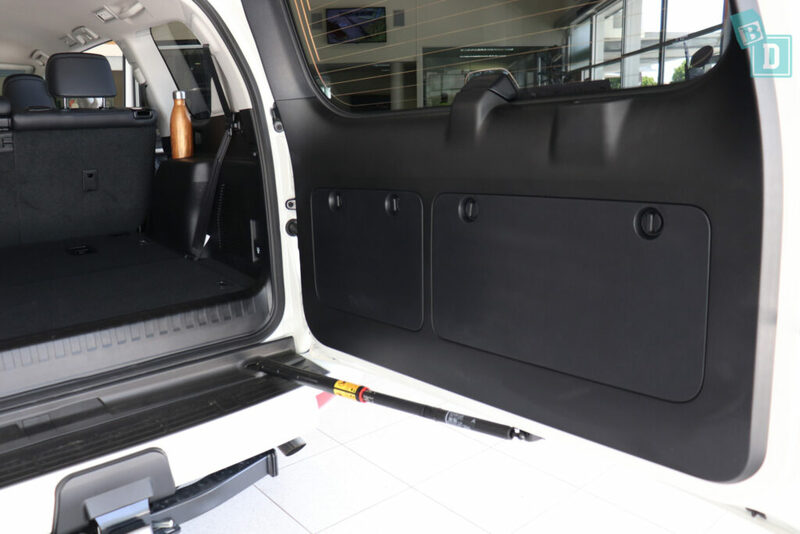 The tailgate of the Prado opens outwards rather than up like a regular boot door. The spare tyre is usually mounted on the outside of the tailgate but on this particular model the spare wheel is stored under the car and the fuel tank is smaller because of this. It does mean the tailgate of the model I tested is split like a barn door and you can open the glass top panel upwards to easily acess the boot. I found this really helpful when parked rear in to a parking space as opening the full door outwards wasn't possible. 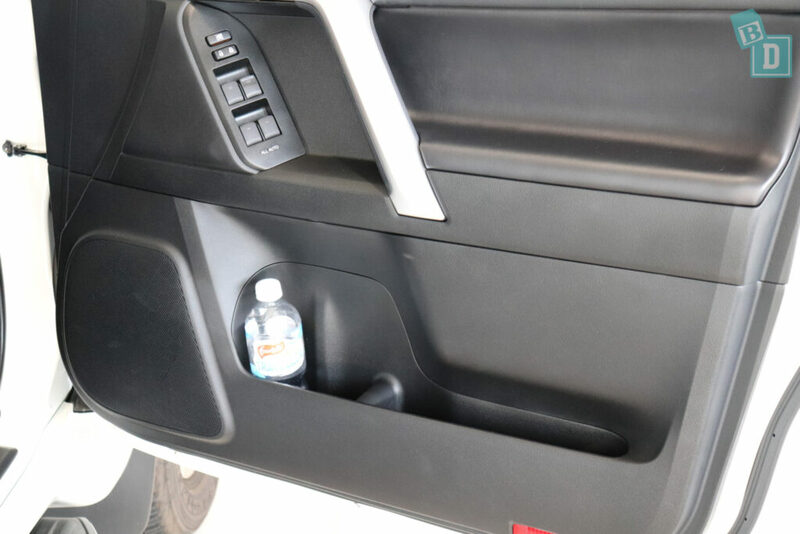 I did find the arm/lever to hold the door open a little concerning, as on the previous Prado I tested, the door was extremely heavy when I was parked on a steep gradient and I didn't feel the arm was strong enough to keep it open. 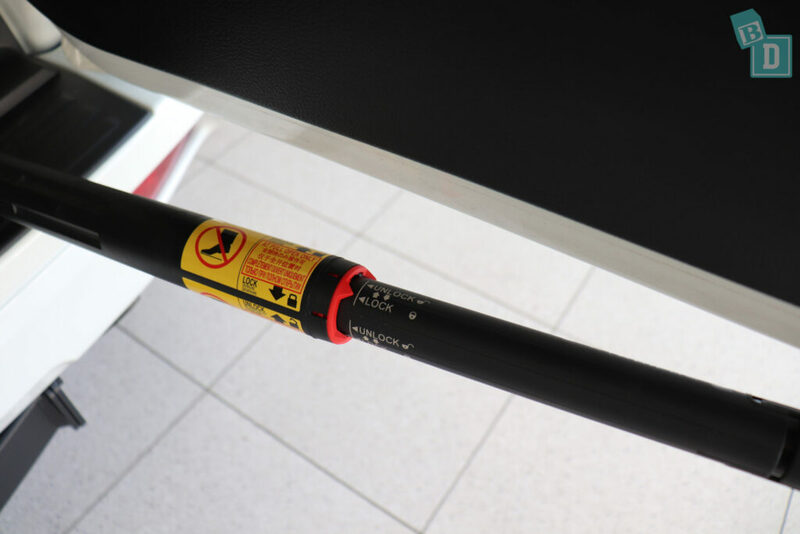 The arm has a simple twist mechanism to lock and unlock it into place and being at toddler height, it could be very appealing and easy for a curious little one to unlock it in the split second you take your eyes off them!! My daughter seemed to make a bee-line for it!!! 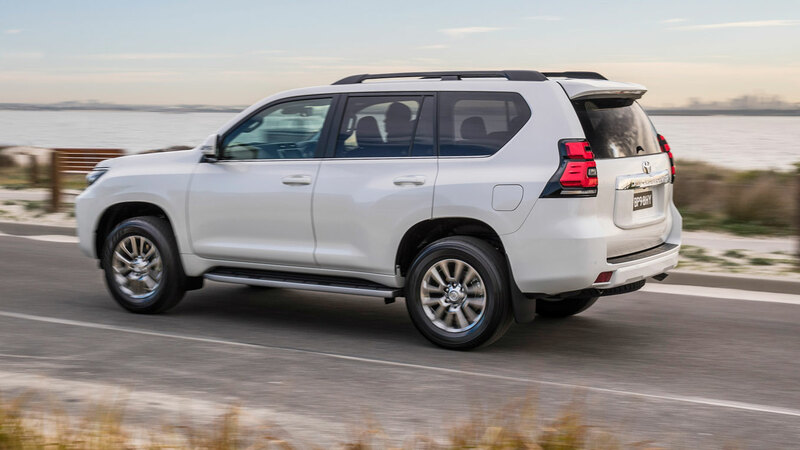 So… How safe is the Toyota Prado? 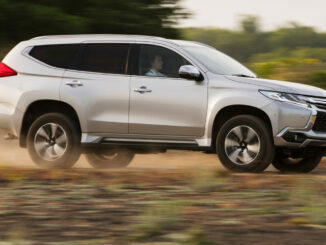 The Toyota Prado scored a five-star ANCAP safety rating in 2011 for 2013 models onwards. The Prado scored 35.11 out of 37 overall in the testing, 15.11 out of 16 for the frontal offset test, 16/16 for side impact test and 2/2 for the pole test. The pedestrian was rated marginal. 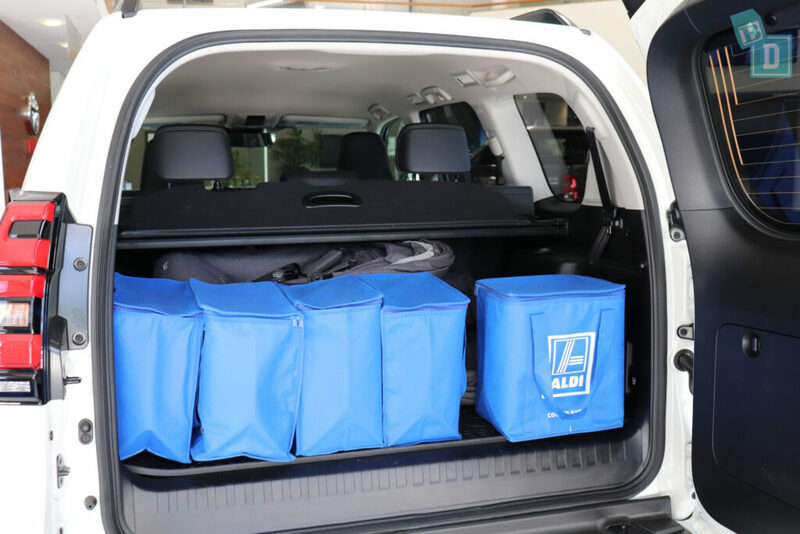 Seven airbags come as standard; there is a driver’s knee airbag as well as dual frontal airbags and front side airbags and side curtain airbags that extend to offer head-protection for the second and third-row side passengers. 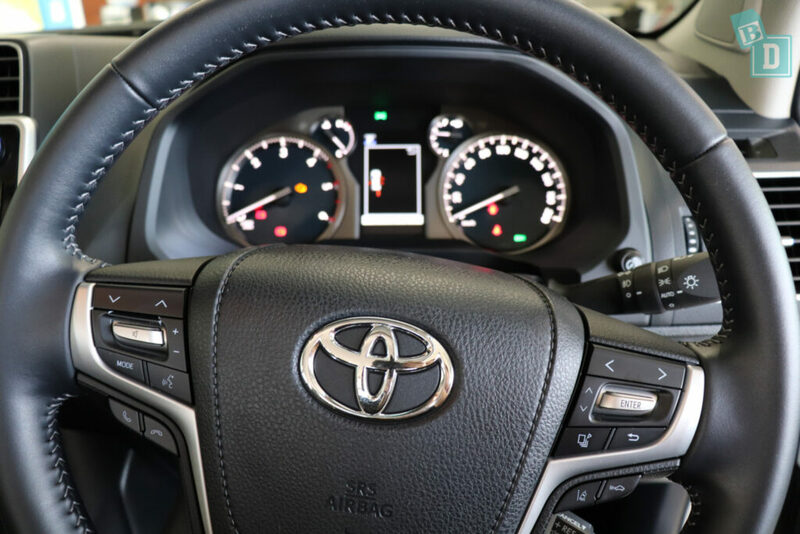 The Toyota Safety Sense package comes as standard on the higher spec VX and Kakadu model Prados and only as standard on the automatic models of the GX and GXL. 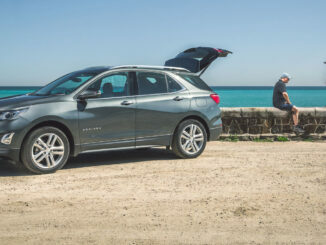 This includes lane departure warning (LDW), pre-collision safety system with pedestrian detection, automatic high beam and active cruise control. 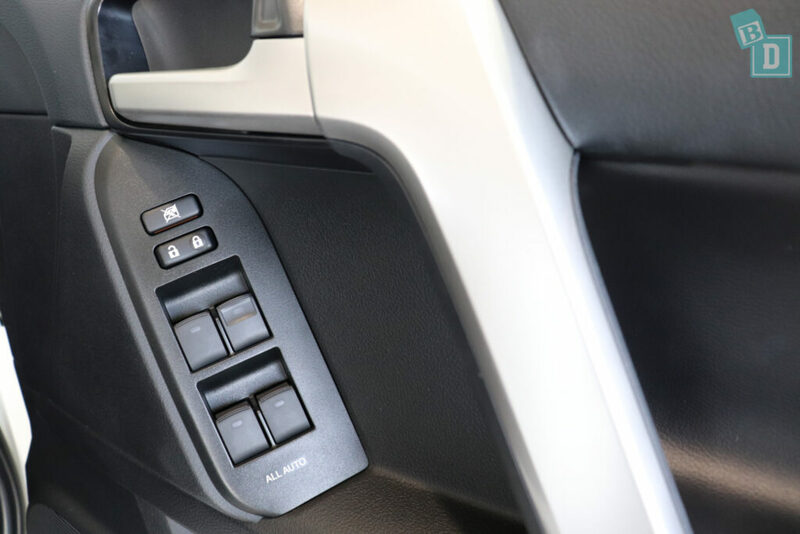 The same varients also come with downhill assist control (DAC) and hill-start assist control (HAC). 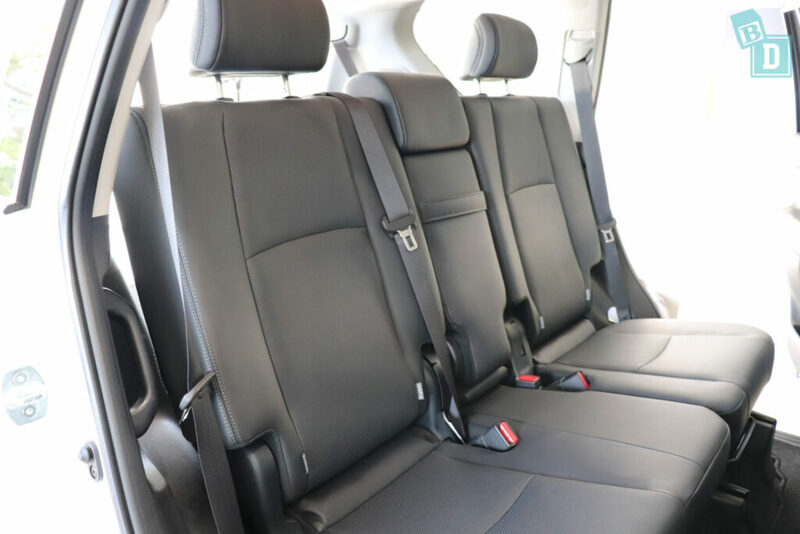 All models only have seat belt warning for the front two seats which is a concern in a seven seater where you can not always see to the second and third-row seats if a passenger takes theirs off while you're driving.